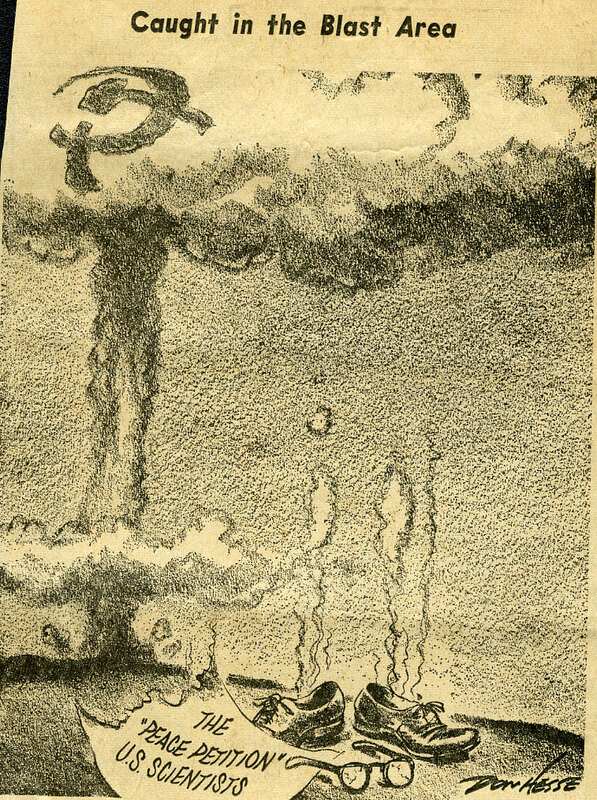 Editorial cartoon published by the Anti-Communist League of York County. Linus Pauling’s tendency toward litigation during the 1960s has been well-documented on our blog. As a central figure in the debate over nuclear weapons testing, Pauling was considered by many to be an important advocate for world peace, while many others called him out as a subversive communist. Pauling’s reputation clearly suffered due to the negative press he received, and over the first half of the decade, he decided to combat these attacks through libel suits against conservative presses and other groups that had published defamatory articles against him. The last three of these cases were filed against the Anti-Communist League of York County, Nevadans On Guard, and the Australian Consolidated Press. These cases all ended poorly for Pauling, a trend that defined much of his litigation. Indeed, out of eight cases that Pauling mounted, he only won two, and they were the two earliest cases. Excerpt from the Anti-Communist League of York County pamphlet that prompted legal action by Linus Pauling. To carry out this brainwashing job, the Gazette and Daily makes use of the following top Communists and sympathizers: Linus C. Pauling, an identified Communist, frequently is quoted on the front page of the Gazette, concerning his distorted views of the effects of nuclear fallout. According to H.C.U.A., he has a history of cooperation with Communist causes. To trust Pauling’s predictions on fallout is to trust the goat in the cabbage patch….The above radicals have much longer pro-Communist and outright subversive histories, but space will not permit a full account. 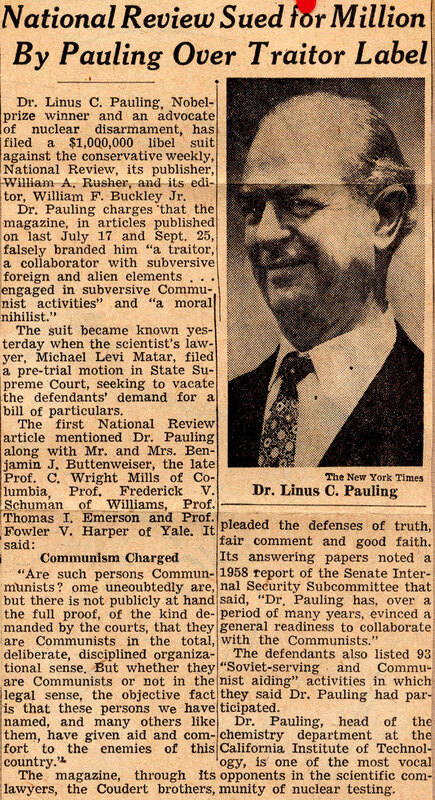 Pauling quickly responded to Gitt, writing “My attorney tells me that the phrase ‘an identified Communist,’ and the reference to ‘outright subversive histories’ are libelous.” Gitt agreed and encouraged Pauling to sue. In June 1962, Pauling wrote to an area lawyer, Henry Sawyer of Philadelphia, inquiring into his willingness to serve as his counsel. In this initial letter, he put forth the gist of his complaint against the Anti-Communist League of York County. The description of me is, in my opinion, defamatory, libelous, and grossly damaging to me. My textbooks of chemistry are used in the State of Pennsylvania and in adjacent states, and the dissemination of defamatory material of this sort may well cause me financial loss….You can understand why I feel that it is necessary for me to protect my reputation in the Philadelphia area, against an attack of this sort….I must tell you that at the present time I am involved in three libel suits, and have just brought a fourth to its termination. The one that was settled was against the Bellingham Publishing Company, Bellingham, Washington. It was settled by payment of the sum of $16,000 to my wife and me. Pauling and Sawyer were aware that Pauling had only about a 50-50 chance of winning and, were he to win, it was likely that the damages received would be modest as the York County group was quite small and lacked significant funding. But at the time, Pauling was more interested in proving his point and casting a warning to others who might entertain the idea of publishing similarly defamatory articles. In the end, Pauling decided to sue the Anti-Communist League and its backers for $100,000, knowing that a payday of this magnitude was very unlikely to come to pass. Once notified of Pauling’s suit, the Anti-Communist League did everything in its power to delay court proceedings as long as possible. This tactic paid off when, in 1964, a landmark Supreme Court Case, New York Times Co. v. Sullivan, was decided. The verdict handed down by the high court in this case set a stiff standard for proving libel against public figures and rendered Pauling’s case virtually unwinnable. Though their hopes of victory were greatly reduced, Pauling and his team moved forward with the York litigation and finally received a pre-trial conference in the summer of 1965. The judge at the conference stated that the case clearly fell within the purview of the New York Times ruling, just like nearly all Pauling’s libel suits. Furthermore, none of the defendants really had any money. Ultimately, a lone defendant offered to settle for $2,000 and Pauling decided to accept the offer. Nonetheless, the damages received represented a clear loss for Pauling, as his legal fees had far exceeded $2,000 by this time. In May 1966, the case was finally dismissed in entirety. Comments by Dr. Detar, a potential defendant in the Nevadans on Guard suit. On October 26, 1963, a small newspaper, Nevadans On Guard, published an article about Pauling bearing the headline “American Communist Given Nobel Prize.” Upon learning of this, Pauling decided to sue Nevadans On Guard, as well as the DeTar family, the Schaefer family, and possibly others responsible for defaming Pauling in the area. In January 1964, Nevada attorney Charles Springer agreed to take on the case. 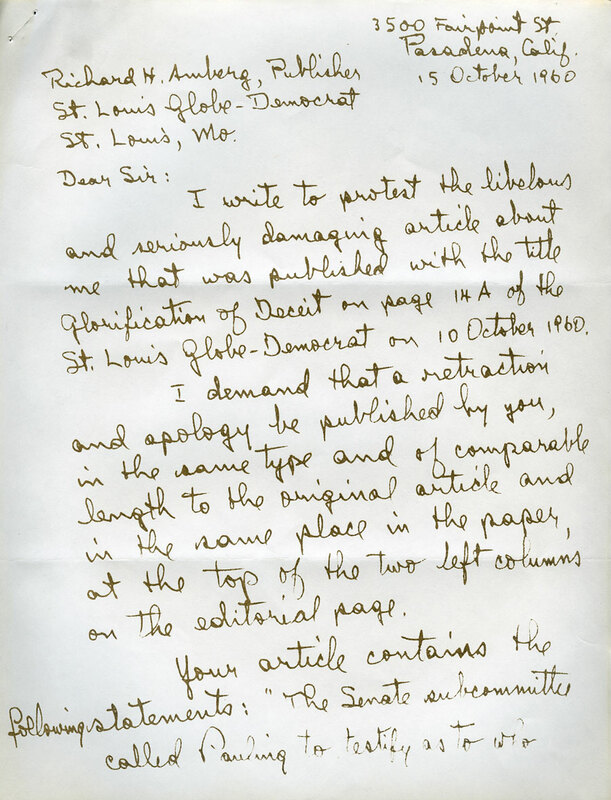 The following March, Pauling lost his case against the St. Louis Globe Democrat at the same time that many of his other legal proceedings were not going as well as expected. Charles Springer was also the State Chairman of the Democratic party in Nevada, so he was quite busy. This need to juggle obligations delayed the filing of Pauling’s suit until 1965. After that point, no additional records about the Nevadans On Guard case remain extant in Pauling’s records. One might reasonably speculate that Pauling decided against going forward with the case since he was already embroiled in so many other losing battles. The Bulletin publication that prompted legal action in Australia. In the Fall of 1964, the Paulings visited Australia to participate in the Australian Conference for International Cooperation and Disarmament. While in Sydney, Ava Helen Pauling was handled a leaflet excerpted from an Australian magazine, The Bulletin, that had been published on October 24, 1964. The leaflet consisted an article titled “But Not Dr. Pauling” that implied that Pauling was a liar and a communist sympathizer. After a bit of investigating, Pauling learned that The Bulletin was owned by Australian Consolidated Press, Ltd., which stood by its article and expressed no fear at the prospect of legal action. One gets the impression of a writer who is not exact or careful, and who wished to make the most biting, extravagant attack, either because he felt you would not hit back, or because he wished deliberately to provoke you to it. Kirby then pointed out that Pauling had made the deliberate decision to be more critical of the US than of the Soviet Union because he believed that it was his duty as a citizen and that he wished to serve as a model of diplomacy among nations. Though Pauling had claimed on many occasions that he did not know anything about communism or communist fronts, few juries were likely to prove overly sympathetic, given Pauling’s long history as an activist. In view of these headwinds, Kirby advised his client that success seemed unlikely. On the whole, therefore, we have very reluctantly come to the conclusion that what the Senate had to say in its Report, and even what the “Bulletin” had to say in its article, could be regarded by a jury as being to an extent justified in the practical sense, by the facts. In so regarding the Senate Report and the “Bulletin” article a jury, you may say, would be acting in an unjustified fashion, yet this we think is what one must do in the ordinary affairs of life, and what we believe the jury may well do in your case, however much the Judge may direct them on these points of evidence to the contrary. A with the York County case, the issue of money emerged as an additional complication. As Kirby explained “Our Supreme Court delivered itself of a judgement in what we call the Uren case, to the effect that a plaintiff is entitled only to compensatory damages, and not to punitive or exemplary damages.” Kirby estimated that a trial would take anywhere from six to eight weeks and that the total cost to Pauling, if he lost, would amount to £10,859.10. Likewise, the total cost if he won was estimated at £954.12. Either way, Pauling stood to lose monetarily with the possible outcome of a fantastic financial loss should the case not go his way. After reading this letter, Pauling understandably decided not to continue with the Australia case and, by September 1966, it was formally concluded. That same year, Pauling lost his appeal in the St. Louis Globe Democrat case. Pauling’s final libel suit, bitterly contested against the National Review, took two more years to conclude, and it too ended in defeat for Pauling. Hampered by a Supreme Court decision that came about in the midst of his most litigious period, Pauling’s legal war against the press cost him a great deal personally and monetarily, and won him little. It was a pleasure to represent you, even though the outcome was disastrous; and I still insist that the disaster was brought about by stupidity and nothing else. In using the word ‘stupidity’ Tonkoff was referring to the court tactics deployed by Pauling’s primary attorney in the case, Francis Hoague. And in addition to his anger over his perceptions of Hoague’s incompetence as a lawyer, Tonkoff also noted that Hoague had shorted him on his compensation for out-of-pocket expenses incurred during the trial. Indeed, Tonkoff suspected that Hoague might have pilfered some of the funds that Pauling had meant to be directed toward Tonkoff. Around the same time, Francis Hoague also wrote a letter to Pauling about the outcome of the court case. In it, he conceded partial culpability for the poor result. I am deeply regretful that the Daily News case did not come out in your favor. I know that it could have been tried better than it was….Whether the case was badly tried or satisfactorily tried, I put my best efforts into it; and whatever mistakes I made were not from lack of concern and thought on my part. I certainly was fully aware that this was an important case not only to you but to the issue of freedom of speech and association and to the peace movement….Of one thing I am sure, and that is that whatever caused defendant’s verdict it was not due to any failure or shortcoming on your part….Despite the unhappy ending, it has been a truly wonderful experience for me to have been associated with you and Ava Helen in these two cases over the past two years. You are the most moral and courageous people I have ever known. In June, Tonkoff wrote another letter to Pauling, expressing mounting discontent with his colleague. By now it was clear the relations were heading due south between the two lawyers. I am convinced that Hoague is incompetent to be in charge of your case. If Hoague believes that this is a libelous statement he can bring an action against me, and I will establish truth of the statement beyond a shadow of a doubt….I unhesitatingly state to you that the further away Hoague is from the court room when this case is retried, the better off you are going to be. Personally, I am certain that the failure of the court to inform the jury that the publication was libelous per se is reversible error. That month, Francis Hoague motioned for new trial; a motion that was rejected. The decision upset Hoague and at that point he decided to turn over responsibility of the case to Eleanor Piel, which was Pauling’s wish as well. 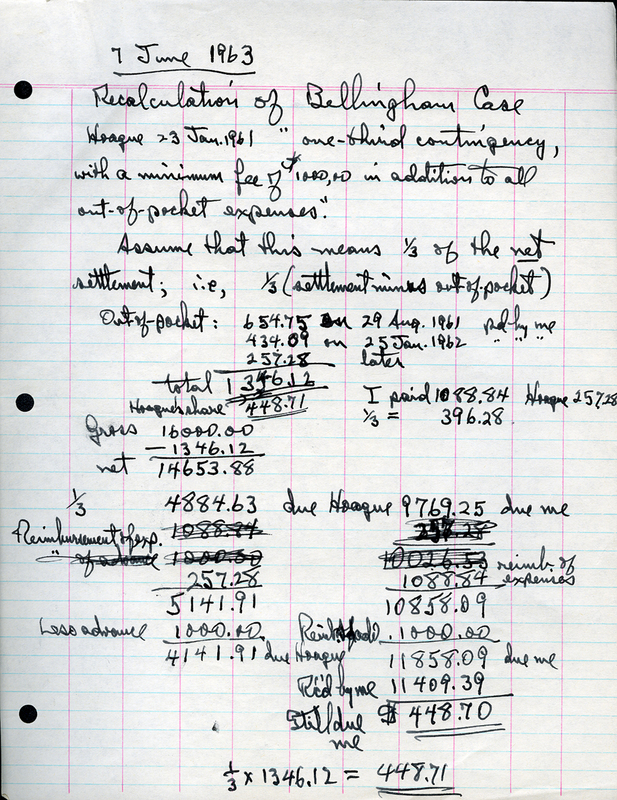 Pauling notes re: expenses incurred by the Daily News case. Meanwhile Pauling, likely spurred by his correspondence with J.P. Tonkoff, became suspicious of his past financial dealings with Francis Hoague. After studying his records, he found that Hoague had underpaid him from the settlement of the Bellingham case and that Hoague had indeed not supplied sufficient funds to Tonkoff for out-of-pocket expenses. After finally receiving the full Bellingham settlement money, Pauling decided to pay Tonkoff’s balance directly, as Hoague refused to release additional funds to Tonkoff and insisted that Tonkoff was lying. I do not know what your full purpose is in sending me these long written tirades with a copy to Dr. Pauling. I am certain that one of your purposes is to blacken me as much as possible in Dr. Pauling’s eyes. This is neither decent nor ethical, and you know it. He also asked that Tonkoff withdraw his involvement in the case. Concurrently, Hoague and Pauling began to discuss an agreement to transfer responsibility for the case over to Eleanor Piel. Hoague suggested that he receive one-third of 50% of the net settlement if they won, and that Piel receive two-thirds of 50%. Pauling would cover all legal costs and out-of-pocket expenses if they lost. Around this same time, Tonkoff wrote back to Hoague concerning his suggestion that Tonkoff withdraw from the case. 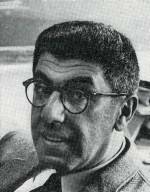 As one might expect, Tonkoff didn’t agree with the idea. Now if you think for one moment that after I supplied to editorial upon which the case was brought, and after drawing the complaint upon which the action was tried, associated New York counsel who appeared because of their feeling toward me and not toward you and who were responsible for getting the case at issue, preparing the instructions which I know you couldn’t possibly prepare, taking town days out of my office and listening to you butcher this case, plus a substantial amount of out-of-pocket expenses and, among other things, furnishing free transportation to you to New York, that I will resign from this case as counsel because you ask me to, you are sadly mistaken. If Dr. Pauling, after he has an opportunity to examine, investigate, and determine the verity of the foregoing facts, decides to retain you as counsel, I demand that he personally advise me of his decision, and then we will go from there. In the letter, Tonkoff also stated that Hoague was attempting to overcharge Pauling for his handling of the case, as the normal litigation fee for libel suits was one-third of the settlement, not half. Pauling agreed with Tonkoff that 50% of the settlement was too much. I am not satisfied with the handling of the Daily News case. I feel, of course, that I share in the responsibility for its outcome. I relied upon you, but I feel now that it might have been wise for you to have discussed the matter of handling the case with me, in New York, and perhaps to have discussed the differences between you and Tonkoff….I propose for your consideration that your withdrawal be on the following basis. You will give up all claim to any share in any sum obtained by settlement or by decision in court, after the agreement to withdraw as my counsel has been made. In the letter Pauling also stated that Tonkoff should likewise withdraw from the case and that Hoague withdraw his financial understanding with Eleanor Piel. Pauling then wrote a separate letter to J.P. Tonkoff personally asking him to withdraw from the case. Tonkoff and Hoague both agreed to Pauling’s requests, at which point the Daily News case was completely transferred over to Piel. In July 1963, Eleanor Piel compiled and formally submitted an appeal to the lower court ruling of Pauling’s libel suit versus the Daily News. One year later, the Circuit Court of Appeals confirmed the original jury’s verdict. Piel then filed a Petition for Rehearing, but in the next month, August 1964, this petition too was denied. Undaunted, Piel and Pauling then decided to file a petition for certiorari with the Supreme Court. But in January 1965, the court decline to hear the case. Indeed, this case and others like it had very little hope for success following the Supreme Court’s 1964 ruling in New York Times Co. v. Sullivan, which set a higher standard for libel of public figures and made it nearly impossible for individuals like Pauling to successfully pursue grievances of this sort. And so ended a decidedly messy chapter in Pauling’s long and complicated history of court action. New York Daily News opinion piece of September 2, 1961. As readers of this blog know, Linus Pauling was a prominent public figure who became especially well-known for his campaign against nuclear bomb testing. The “Appeal by American Scientists to the Governments and Peoples of the World,” circulated by Pauling and his wife in 1957 and 1958, garnered the signatures of over 11,000 scientists from around the world, each of them condemning the detonation of nuclear weapons in the atmosphere. 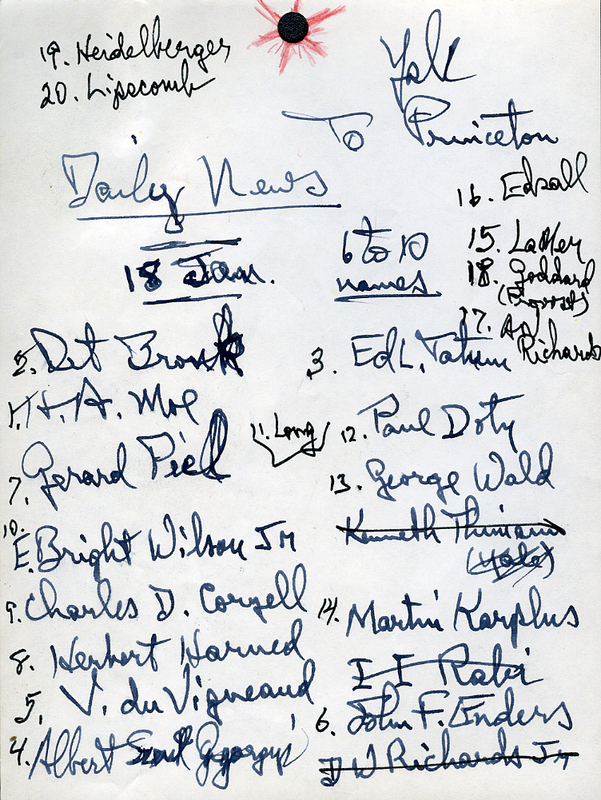 The petition received a great deal of attention and ultimately led to Pauling’s receipt of the Nobel Peace Prize in 1963. The petition also came about in the midst of the Cold War, and Pauling’s protests made many Americans uncomfortable and even angry. Much of the public saw his efforts to work with communist countries as evidence of communist sympathies and, by extension, betrayal of the United States. Many newspaper editors around the country took a similarly dim view and attacked Pauling in print for his actions. Naturally, Pauling worried about the impact that articles of this sort might make on his reputation, and he chose to fight back against numerous media sources through libel lawsuits. For years, a couple of semi-prominent American loudmouths have been agitating against nuclear weapons and weapon tests – the best defense the West has against Soviet Russian and Chinese Red manpower. [Norman] Cousins and Pauling now profess to be horrified by Khrushchev’s announcement of Soviet resumption of nuclear weapon tests…But all that Pauling has done about it is to record a plea to his friend in the Kremlin to reconsider…It’s nice to have these two on the American side for once, however belatedly and lukewarmly. But their ideas on meeting the Khrushchev threat are no better than their longstanding proposals that the West cripple itself. Reader Louis B. Settner wrote to Pauling informing him of the opinion piece and likewise wrote a letter to the editors of the Daily News that defended Pauling and objected to the editorial’s tone. The Daily News refused to publish Settner’s letter, but the protestations to the piece were far from over. are shocking, and of course it is shocking that the Daily News would not publish your letter. The captive press in the United States is a great danger to civilization. I am pleased to tell you that I probably shall institute suit for libel against the Daily News, on the basis of the defamatory editorial. Francis Hoague, Pauling’s Seattle-based lawyer in a concurrent libel lawsuit filed against the Bellingham, [Washington] Herald, offered to take on the case for a fee of one-third of any settlement reached out of court or for half of a settlement arrived at in court. Hoague had already taken care of most of the preparation required for the Bellingham case, which was filed in response to editorials published in late November and early December 1960, and likely saw himself as a natural fit for this new complaint. 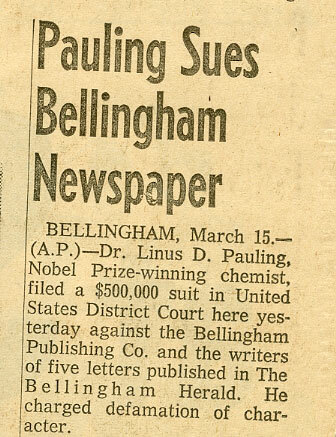 The case against the Bellingham paper, one of Pauling’s first lawsuits, was instigated in early 1961 and proceeded with relative rapidity. The dispute reached a settlement out of court in April 1962 with Pauling agreeing to damages of $16,000 plus a retraction. As it turned out, this was one of only two libel lawsuits, out of eight filed in total, that ended in Pauling’s favor. List of East Coast-based character witnesses supplied by Pauling to his lawyer, Francis Hoague. Throughout 1962, Pauling’s team worked gather information and depose witnesses. As had been the arrangement in Bellingham, Francis Hoague worked on the Daily News case in collaboration with another more experienced lawyer, J.P. Tonkoff, though Pauling’s contract was technically with Hoague alone, and not Tonkoff. Hoague and Tonkoff had worked well together on the Bellingham case, but they became very frustrated with each other as work on the Daily News complaint moved forward. Over time, Tonkoff came to believe that Hoague was incompetent as a litigation lawyer and expressed a wish that he were in charge of the suit, rather than Hoague. In February 1963, the Daily News suffered a damaging blow in the form of a $201,000 verdict against the paper for having libeled a different plaintiff. This particular suit was filed by Paul J. Kern, a project manager for the New York City Housing Authority, whom the Daily News had declared to be a communist. Eleanor J. Piel, Kern’s high-profile lawyer, was a key player in the success of Kern’s suit. Pauling’s complaint first came to trial in May 1963. Pauling’s chief counsel, Francis Hoague, included in his tactics a large number of character witnesses who spoke positively of Pauling’s character, and ultimately this strategy backfired. One of the character witnesses, chemist (and future Nobel laureate) Martin Karplus, spoke of the trial and the verdict in a 2013 oral history interview conducted by the Oregon State University Libraries. …it was in New York, the trial, and so I went down and did testify for him, as did various other people. And then, as I remember it, he actually lost the case because the judge felt, ‘look, if you’re going to have all these people testifying for you, a libel suit really doesn’t make any sense’…and the judge said this, I remember, was that he had all these sterling witnesses, so he wasn’t harmed by what they [the Daily News] wrote. I mentioned that I thought that Mrs. Piel, with her experience and knowledge of the New York courts and the opposing lawyer, could do a better job than Mr. Hoague himself. I pointed out that I felt that he was not tough enough for Mr. Carter and the New York courts. As we’ll see next week, the situation became rather strange at this point. Linus Pauling’s involvement in the peace movement, and particularly his circulation of what is now know as the United Nations bomb test petition, made him doubly famous: he was no longer just a scientist, but a humanitarian as well. This fame came at a price though, as his peace efforts did not always receive the positive acclaim afforded much of his scientific work. In an era of McCarthyism and Cold War fear of communism, his activities were sometimes viewed as a threat. 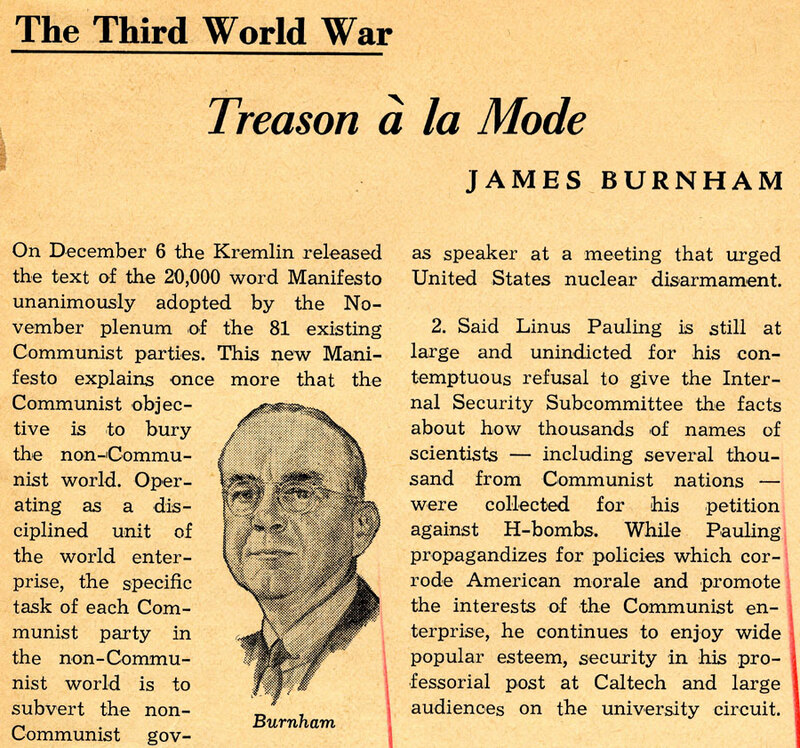 Despite Pauling’s attempt to foment nonpartisan promotion of peace, any efforts to curb US armament was seen by many as de facto communist collaboration. Pauling was monitored by the FBI and questioned twice by the Senate Internal Security Subcommittee (SISS), a committee that was very suspicious of Pauling’s peace activities, especially the petition against nuclear bomb testing. The subcommittee subpoenaed him in June 1960 and demanded to see the names of all those who had helped gather signatures for the petition in 1957 and 1958. Pauling refused to provide this information as he felt a moral obligation to protect others from the types of governmental investigation that he himself was experiencing. The group subpoenaed Pauling again in October, but when he once more refused to produce the names the group backed down and he did not suffer any legal consequences. The Senate subcommittee called Pauling to testify as to who helped him collect the petitions. Pauling contemptuously refused to testify and was cited for contempt of Congress. He appealed to the United States District Court to rid him of the contempt citation, which that court refused to do. The appeal from the lower court’s affirmation of contempt is expected to be handed down by the Supreme Court today. In fact, while Pauling did refuse to release the names of the people who helped him to collect signatures, he was never cited for contempt of Congress. Much is made of the fact that Pauling is a Nobel Prize winner. That is no guarantee of anything more than proficiency in chemistry. It certainly is no guarantee of either patriotism or correctness in foreign policy. It above all does not cloak him with an immunity to defy the Senate and to decide on his own prerogative what is best for America. A great St. Louis institution is being badly used, nor is it the first time, by a group which glorifies deceit and evasion in the outrageous guise of freedom of speech and conscience. Your completely untrue statements have without doubt greatly damaged my reputation and impaired my integrity in the minds of your readers in the St. Louis district and of others who may have seen them in your paper or possibly in other publications where they may have been quoted from your paper…I protest against your imputation that I am lacking in patriotism, and I demand that it be retracted. Pauling’s letter was sent along with a letter from his lawyer, A.L. Wirin, insisting that both Pauling’s letter and a retraction be published. Not suprisingly, many others in St. Louis – in particular, a number of Washington University faculty – were outraged by the Globe-Democrat’s opinion piece. Several people wrote letters to the editor condemning the editorial, the paper was deluged with phone calls, and a protest was staged at the university. Although some of the outraged letters were published, the negative response was mostly underplayed. In particular, the protest event received little news coverage and the article’s dissenters were subsequently dismissed in later editorials. The Globe-Democrat published Linus Pauling’s letter on October 24th but offered only a very mild retraction, so Pauling decided to sue the paper for $300,000, claiming damages to his reputation. He immediately secured the services of at least three lawyers, who pretty quickly encountered an unforeseen problem: the court involved in Pauling’s libel suit demanded that he produce the names of the people who had helped to collect signatures for the nuclear bomb test petition. This was the very information that he had worked so hard to protect during the SISS hearings. The request presented him with a moral dilemma, one spelled out in a letter that he wrote to his lawyer in December 1960. Most of these 59 American scientists are people of such established reputation that it might be thought that no reprisals could be visited against them. However, the fact that I have suffered through being subpoenaed by the Internal Security Subcommittee and through the issuance of damaging statements about me by the Acting Chairman of the Subcommittee shows, I think, that I cannot by any means be assured that reprisals would not be visited against these scientists, despite their established reputations….The attack on me by Senator Dodd and the Internal Security Subcommittee has continued even after the hearing, and I feel that I cannot turn over names to the Subcommittee or make the names public in such a way that the subcommittee would come into possession of them. 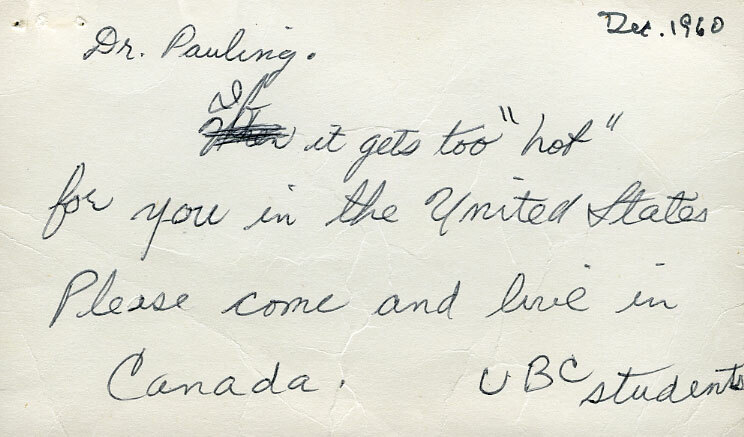 After receiving a letter from his lawyers urging him to change his mind, Pauling replied in January 1961. Senator Dodd did not overrule my objection and direct me to produce the names. In view of this fact, I believe that I am justified in continuing to keep these letters of transmittal confidential. Men, like Pauling, who should know better, and the many in St. Louis and elsewhere who immediately leaped to his defense, have wittingly or unwittingly—and we believe they knew what they were doing—played the Communist game. I think that it is my duty to make a decision about the letters still in my possession from American scientists who communicated the signatures of themselves and other scientists to the Appeal….Of all of the approximately 60 Americans whose letters I have, you are the one who is most closely connected with the Appeal, other than myself….Your close connection with the Appeal is of course on the public record….I think accordingly that the difficulty that you have found in deciding how to respond to my request, and have expressed in your two letters to me, provides the answer to the question that was on my mind. I believe, as you do, that those of us publicly associated with the Appeal have a moral duty to protect from harassment the others who helped in this work….I would regard any demand for details regarding the circulation of the Appeal as a serious threat to academic freedom, and I would consider it my duty as a member of the academic community to resist such a demand….My own judgment is that I could find no justification for giving the Globe-Democrat attorneys answers which I would refuse to give the government agency. In general, I do not understand why my letter is relevant and necessary in order to establish that the Globe-Democrat made false and damaging statements about you. Further, it seems to me that the suit could – regardless of who wins it – have the effect of bringing about a violation of the principles for which you have fought so hard, and in the local circumstances it may precipitate the kind of harassment of our colleagues that is so repugnant to all of us. While Commoner’s letter built a case against making the letters of transmittal public, another signature gatherer, Charles Coryell, did give permission for his name to be used in court and did not seem concerned about the consequences. After much thought on the matter, Pauling ultimately decided to release the names for the lawsuit. Editorial cartoon published in the St. Louis Globe-Democrat, September 12, 1961. It is Dr. Pauling’s considered view that the suit should be filed. We realize fully that it may not be possible to obtain for Dr. Pauling the public vindication which he deserves, as you put it so well. But we feel that good conscience is on Dr. Pauling’s side; good conscience should prevail in the courts; and Dr. Pauling is willing to take the chance that it may not. The editorial further frustrated and angered Pauling, in part because inspection of testing programs in other countries was clearly mentioned in the 1958 petition. 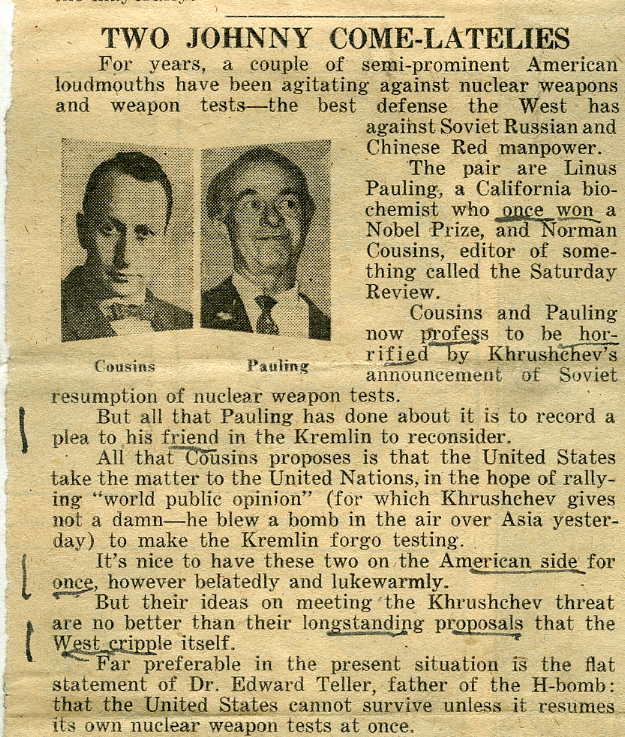 Pauling also regularly spoke out against testing in all of the era’s nuclear nations. By this point, Pauling’s support system was starting to erode. Barry Commoner, in particular, now found himself in active opposition to Pauling’s lawsuit. Though he remained Pauling’s friend and certainly was in line with most of his activism, he was worried about Pauling’s decision to turn over the names of those who circulated the petition. His hope was that Pauling would drop the lawsuit to mitigate further risk to his and others’ reputations, especially in St. Louis. 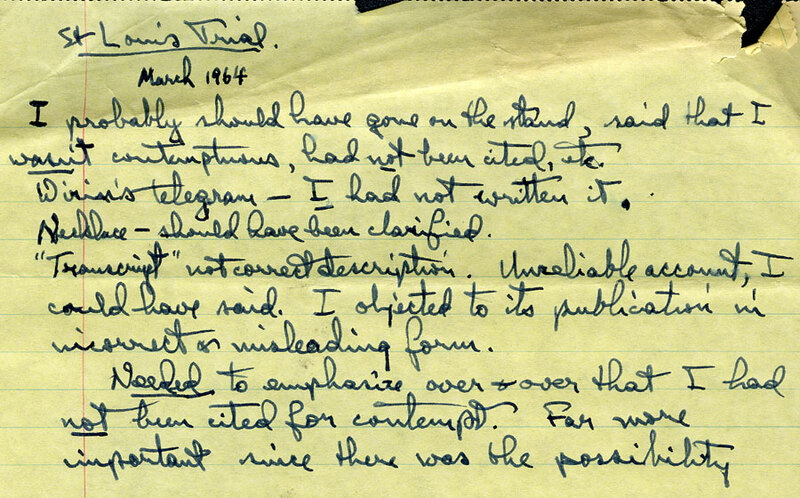 Pauling’s notes on the Globe-Democrat jury trial, following its conclusion. March 1964. In March 1964, Pauling’s libel suit faced a jury trial in St. Louis and was defeated. Pauling filed many libel suits in the early 1960s and most of them were lost due to an important United States Supreme Court ruling, New York Times Co. v. Sullivan, that established a higher standard of proof for libeling public figures. Interestingly, Pauling lost the Globe-Democrat case before this new paradigm had been established. It may well be that Pauling’s lawyers’ fears had been justified; that his case had gone down in flames largely because of the negative public sentiment engendered by its defendant, the Globe-Democrat. Embattled and in a stubborn frame of mind, Pauling decided to appeal for a re-trial, but the following year his request was rejected. His lawyers appealed a second time and in 1966 they received an opinion from the United States Court of Appeals denying the claim, based on the New York Times ruling. Pauling then filed a writ of certiorari, but that too was dismissed in 1967. And so it was that the Globe-Democrat debacle finally came to a conclusion, nearly seven years after it began. From the years 1960 to 1968, Linus Pauling either threatened or actually instigated several libel suits against various newspapers and media outlets throughout the country, demanding retractions and financial compensation for defamatory statements issued about him. The damaging statements usually stemmed from Pauling’s hearings before the Senate Internal Security Subcommittee in 1960, during which the inquisitors grilled Pauling about his activities in the peace movement, especially his 1958 nuclear bomb test petition, and repeatedly implied that he was a communist sympathizer. Pauling was not a communist and, in fact, had led a large research effort on behalf of the U.S. war effort during World War II, work for which he earned several commendations, including the Presidential Medal for Merit. So naturally, Pauling was very frustrated when newspapers around the country began to question his loyalty to the US, and he became increasingly alarmed as his reputation was attacked amidst the heightened tensions of the Cold War era. One of the first newspapers to provoke legal action from Pauling was the Bellingham, [Washington] Herald. In late November and early December 1960, shortly before and after Pauling gave a talk at Western Washington College, the paper published five letters to the editor attacking Pauling. The letters contained factually incorrect information, such as the suggestion that Pauling had appeared before the House Un-American Activities Committee (rather than the Senate Internal Security Subcommittee) and that he was a communist. The letters also accused him of other communist-related activity that had never been proven by the Senate Internal Security Subcommittee. In early December, Pauling wrote to the newspaper demanding a retraction of the letters that it had published. The Herald responded quickly, printing a note explaining that they were “unable to substantiate the claims” of one letter published on December 2nd by Martin Gegnor. That stated, the editors ended their note by declaring that “it is the policy of this newspaper to give free expression to our readers.” They likewise noted that the Herald, in its December 2nd issue, had also printed a long letter from the wife of the president of Western Washington College extolling Pauling’s scientific achievements. Pauling decided to sue the Bellingham Publishing Company and the letter writers for libel. He later dropped his case against the individuals and decided to focus entirely on the newspaper, which he sued for $500,000. Pauling complained that the allegations in the letters were untrue and that he had no communist tendencies. He also claimed that damages to his reputation might result in the loss of royalties from his three textbooks, which amounted at the time to about $40,000 per year. It seems to me that you face a dilemma. On one hand, if you dismiss your action against the Bellingham Publishing Company the same ploy will be used in all three remaining libel actions [since instigated by Pauling]. Furthermore, this successful defense to this libel action might lay you open to a rash of defamation, since the defamers would know that they had a defense to any suit brought by you. Also, your dropping of this action, and I assume of the other three actions, would be used by certain columnists to indicate your admission of the truth of the accusations. Pauling decided to disclose the names of his fellow petitioners, in spite of his desire to protect them from potential federal investigation. The list totaled about 650 names, including approximately 450 Americans. 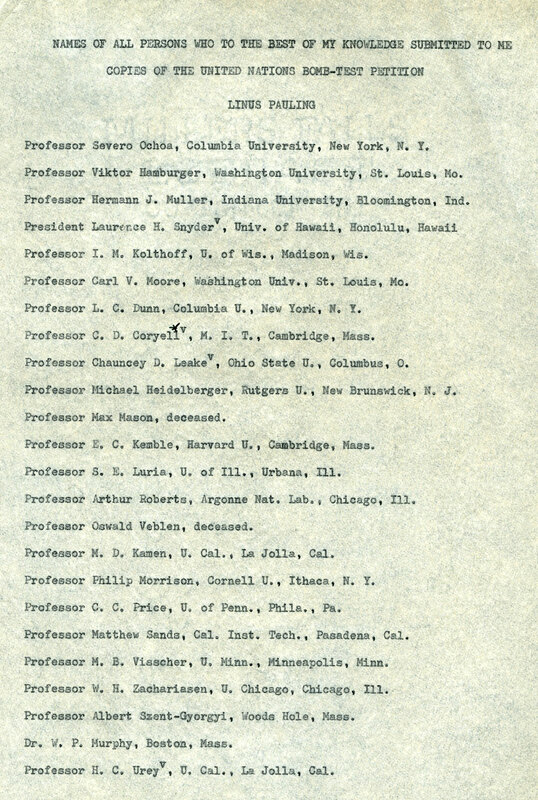 Page 1 of Pauling’s list of those who helped to circulate the bomb test petition. In January 1962, before the case came to trial, Pauling offered the Bellingham Publishing Company a settlement: $75,000 in damages plus a retraction. After negotiating for four months, the parties agreed to a penalty of $16,000 plus a retraction. The settlement was likely close to what Pauling would have received through the full prosecution of a successful suit. The outcome also allowed him to spend less in legal fees, and was hoped to deter other news sources from libelous actions of a similar nature. In late November and early December, 1960…this paper published in its Letters to the Editor column five letters in which the writers attacked Dr. Pauling. These letters contained untrue statements which, if believed, would have reflected on Dr. Pauling’s integrity and loyalty to the United States of America. These defamatory letters were published in error in reliance upon the writers, without investigation by the paper. The Herald takes this opportunity to state publicly that it regrets that it published these statements reflecting on the integrity and loyalty of Dr. Pauling. Up until the time when you sued the Bellingham Herald, the John Birch Society had a firm grip on city and school affairs in Bellingham and virtually no one dared to challenge them…Your suit was the turning point in this matter, and since then the John Birch Society has had relatively little influence and can be quickly and effectively challenged when necessary. Even the Bellingham Herald has shown a change of heart in liberal matters…so your efforts in that respect were not in vain. Mrs. Helen Mazur talked to me today. Her husband is Professor of Demography in Western Washington University, Bellingham…. She and her husband arrived at Bellingham just at the time that I came to give the Commencement lecture. We learned when we arrived there that some derogatory material had appeared in the Bellingham Herald. I sued, and the case was settled out of court with payment of $15,000 [sic] to me. Mrs. Mazur said that when she arrived in Bellingham just at that time she met the president of the local bank. For some reason that she does not understand he began talking to her about me, and said that he had gone to the editor of the newspaper to suggest that something be done. She says that he said that he and the editor had written a letter attacking me, which was then published in the Bellingham Herald. It was this letter, with a false name and address, that was the basis of my suit. She also said that the newspaper borrowed the $15,000 from the banker’s bank in order to make the payment to me. I had not known that the newspaper editor and the banker had conspired to write this letter. 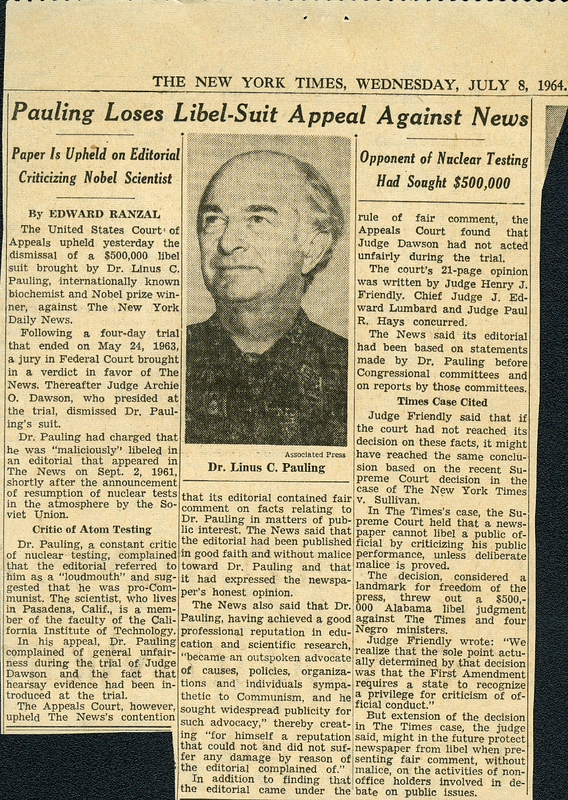 Upon learning about Linus Pauling’s lawsuit, the National Review responded by deliberately provoking him, publishing an article in September 1962 titled “Are You Being Sued by Linus Pauling?” In answering their own question, the magazine’s publishers pulled few punches in reaffirming the stance that had so angered Pauling in the first place. We are (or so his lawyers tell us). And so are other well-behaved papers and people throughout the country. Professor Pauling…seems to be spending his time equally between pressing for a collaborationist foreign policy, and assailing those who oppose his views and who question whether this country can simultaneously follow Dr. Pauling’s recommendations and remain outside the Communist orbit. Dr. Pauling is chasing after all kinds of people….His victory signal is the check or two he has wrested from publishers – who may indeed have libeled him, in which case they should pay up; but who may simply have been too pusillanimous to fight back against what some will view as brazen attempts at intimidation of the free press by one of the nation’s fellow travelers. This public response made it clear that the National Review’s founder, William F. Buckley, had every intention of fighting the lawsuit to its end. At the time, Buckley’s response probably seemed ignorant to Pauling since he had already won a settlement against the Bellingham (Washington) Herald and was in the midst of a complaint against the Hearst Corporation that would result in his receipt of $17,500 in June 1963. A twist was soon to arise, however, that made a major impact on Pauling’s strategy as well as that no doubt contemplated by an untold number of other individuals used to living their lives in the spotlight. Pauling officially filed suit against the National Review on January 17th, 1963. 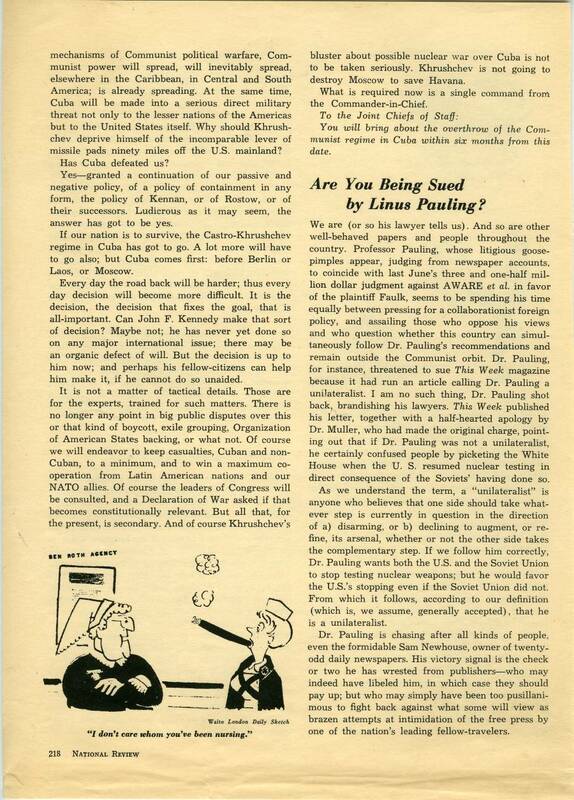 However, Pauling’s case against the magazine was delayed for over three years, until March 1966, for a number of reasons: the need for information gathering; Pauling’s receipt of the Nobel Peace Prize in December 1963; and Buckley’s running for mayor of New York City in 1965. This delay proved to be crucial as, in 1964 a landmark Supreme Court case, New York Times v. Sullivan, was decided. New York Times Co. v. Sullivan is the United States Supreme Court case that ultimately enabled the media to comment freely on public officials without worry of being sued for libel, except in cases of provable “actual malice.” The decision established the definition of “actual malice” as a publisher knowing that a published statement was false or acting in reckless disregard of its truth or falsity at the time of printing. From there, the burden of proof in a libel case was outlined as falling on the plaintiff, who was charged with establishing “actual malice” on the part of the defendant. Doing so is generally fairly difficult as there is often little evidence documenting the details of which a defendant was or was not aware. The Court handed down this ruling in order to protect the First Amendment and it proved to be hugely influential. Aside from cases like Pauling’s, New York Times v. Sullivan made a significant impact on the Civil Rights Movement as, prior to the case, media in many southern states were wary of reporting on civil rights abuses for fear of libel action. The New York Times decision did allow for future case-by-case determination of identifying parties subject to the burden of proving “actual malice.” Importantly, the possibility of extending the Times ruling beyond public officials seems to have been suggested first (or at least very early) by the United States Court of Appeals for the Second Circuit in Pauling v. News Syndicate Company, tried just four months after New York Times case. Decisions made in Pauling’s lawsuit against the News Syndicate Company helped to establish a precedent of extending the New York Times v. Sullivan ruling from public officials to public figures. If his scientific work hadn’t done the trick, by 1964 Linus Pauling had certainly made himself a public figure through his prominent involvement in the international peace movement, to say nothing of two Nobel Prizes. In determining that the Times ruling applied to him as well, the courts began to expand the restricted definition of libel to parties outside of public officialdom, an evolution that proved very damaging to Pauling’s litigious streak. New York Herald Tribune, April 20, 1966. The constitutional guarantees [of the First and Fourteenth Amendments] require, we think, a federal rule that prohibits a public official from recovering damages for a defamatory falsehood relating to his official conduct unless he proves that the statement was made with ‘actual malice’ – that is, with knowledge that it was false or not. would seem to favor extending the doctrine of that case at least to a private person who ‘has thrust himself into the vortex of the discussion of a question of pressing public concern.’…It is clear that if any private citizen has, by his conduct, made himself a public figure engaged voluntarily in public discussion of matters of grave public concern and controversy, Dr. Pauling has done so. Finally, the criticisms made of him in the alleged libelous articles are not criticisms of his private life; they are criticisms of his public conduct and of the motives for that public conduct. I believe that the new criterion, as stated above, should not be upheld by the Supreme Court of the United States, because it places a reward on irresponsibility. I believe that the utterances of false and defamatory statements should be required by law to assume some responsibility, even though the false and defamatory statements are made about public officials or public figures. Bruised by his National Review loss and disappointed by the New York Times verdict, Pauling actually contacted another lawyer, Louis Nizer, in hopes of finding a way to reverse the Supreme Court’s thinking on the standard of libel for public figures. Nizer, while pessimistic, agreed to initiate an attempt to get the public figures extension of the New York Times case overturned. Indeed, his firm appealed the case for three years, but ultimately conceded to the dismissal of its case in 1968. In the wake of the bitter National Review saga, Pauling ended up either losing or abandoning all of the other cases that he had in motion. His legal power had been taken away by New York Times vs. Sullivan and, though often provoked over a lifetime that remained controversial, he never again mounted another libel case. National Review, May 3, 1966.